Are you afraid of severe thunderstorms such as tornadoes and hurricanes? Do you get nervous every time the weatherman forecasts severe weather? Does the idea of a tornado warning (or dark suspicious clouds) make your stomach cramp with fear, and send you to a panic to the basement or closet? Is the panic so severe, that you find yourself checking the weather every few minutes, cancelling events due to tornado watches, and more? If so, you’re not alone! Lilapsophobia is the “medical term” for a fear (or phobia) of tornadoes. Astraphobia is a term used to described to severe weather (or thunderstorms in general). Together, these two phobias account for the relatively common fear that some people have. Interestingly enough, sometimes animals (such as dogs) can also have a fear of thunderstorms. I suffered with this for a long time, but now I have this fear over control. In this article, I’m going to give a detailed overview of this condition, as well as some practical tips on how you can overcome your fear of thunderstorms. Why Am I Afraid of Tornadoes and Severe Storms? Trauma experienced during a severe storm– If you’ve ever been a severe storm or tornado, this probably left a sensitivity and awareness of the devastation they can cause. Therefore, you have now learned to fear the awesome power of these powerful forces. Seeing videos or footage of these storms–Sometimes seeing the devastation left by these on the news, in pictures, and on the internet may have left an impression on you that left a deep fear in your mind. Losing a Loved One–Losing a loved one in severe weather can also cause stress and trauma that may result in a fear of tornadoes, hurricanes, and storms. My fear of tornadoes began when I was young (perhaps around age 8). As I browsed through the encyclopedia set in my house, I came across the “T” encyclopedia. As I flipped through the pictures, I stumbled upon the section on tornadoes. As I seen pictures of massive black swirling funnels and horrendous devastation left behind by them, I was immediately blown away (no pun intended) by the power of these storms. When I read the article, it was even worse. The article went on to mention just how deadly they are, how they can strike pretty much anywhere in the United States (and even the world), and so forth. Pretty soon, I had developed a fear each time a thunderstorm came. This fear worsened over time, as I was exposed to many severe storms over my teen years. One day, a storm was so bad, it every single tree outside of my house was bending every back and forth frantically, dime sized hail was crashing down on the ground, and loud thunder clapped through for over half an hour. 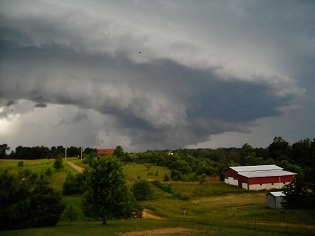 As this progressed, I found myself constantly stressing about storms in the spring and summer. I would keep the weather channel on all day when there was a chance of storms. I knew the names of all of the regular meteorologists. I would have a blanket ready and a plan to head to the basement each time a watch or warning was announced. Each time a storm rolled through, I’d inspect the clouds for any suspicious looking funnel-shaped clouds. So if you are suffering with a very strong fear of tornadoes, I hope this article helps. Here are some practical steps everyone can take to help prepare and come to grips with an extreme fear of storms. Education is one thing that has really allowed me to get a grip on my fear of storms and tornadoes. Before I learned more about storms, I just supposed that tornadoes can simply drop out of nowhere. The truth is, tornadoes only develop with the right ingredients. There has to be wind shear (ie, winds going different directions at different levels of the atmosphere, instability (in the form of hot vs cold air masses, or a front passing through), the right temperatures (tornadoes are much more likely to form in a hot, humid condition, rather than cold and snowy), and so forth. A. Realize the statistics and nature of tornadoes–While tornadoes can and do occur, the majority of them are considered “weak” tornadoes. This means they will only do minor damage to most sturdy buildings, such as blow off shingles, damage trees, etc. More powerful tornadoes (EF3 or greater) can do much more serious damage, such blow off roofs, or even level a structure. However, these are relatively rare, and each year there are usually only a handful of these very powerful tornadoes. Also, out of all of the millions and millions of people in the United States, the death toll each year from tornadoes is usually less than 1,000. This means that car wrecks or obesity (or even getting struck by lightening) is a more serious threat to your life than a tornado (statistically speaking). B. Learn to Read a Doppler Radar–It is also very helpful to learn the exact location of your county and city on a Doppler radar map, and also what the colors mean on a radar. This can help you identify thunderstorms, and know ahead of time if they are heading for your area. For example, I regularly check weather.com to see the radar. You can expand or zoom in on your region to see where thunderstorms are currently located, as well as the general direction in which they are moving. Here is a sample Doppler radar below. 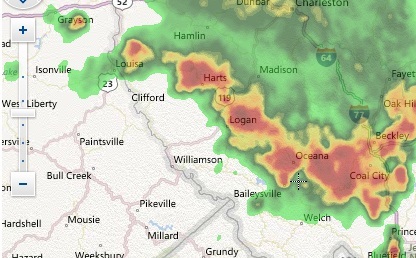 Those red blobs are thunderstorms with heavy precipitation. They may or may not be severe, but they almost certainly have very heavy rainfall. It is always possible that they may contain hail. Tornadic storms are also generally red blobs like that, but meteorologists can often use a special radar to see if the storm has any “rotation.” If they pick up any rotation at all, they generally issue a tornado warning. In the radar above (the storms were moving downward towards the South), you can tell that the city of “Welch” is probably about to get a good soaking. Just be warned that sometimes storms have a mind of their own. I’ve seen severe thunderstorms bright red like you see above, that were just one county away from me and sending off tornado warnings, only to completely weaken and fall apart by the time it reached me (thankfully!). Also, sometimes a storm may be in the process of developing, and the radar doesn’t quite show its power yet. So while these are good, just remember that storms can weaken and strengthen quite rapidly. C. You Can Become a Trained Spotter–Many meteorology or national weather service locations also offer “trained spotter” courses (often for free or a small fee). These will educate you about how tornadoes are formed (typically during “rotating” thunderstorms, also called supercells). They will also help you identify the difference between low hanging clouds (scud clouds), and actual funnel clouds (sometimes the two can be confused). By taking a spotter’s class, you can probably ease your conscious a bit by not “freaking out” every time you see a false alarm on a cloud. Also, like I mentioned above, you can learn that tornadoes are actually aren’t very common, and severe outbreaks are usually scattered over thousands and thousands of miles. It takes just the right ingredients for them to form, and most of the time they are very short-lived and relatively weak. Even though people can develop extreme fears of tornadoes, the truth is that it is GOOD to have some fear of them. This keeps us safe, and we all have natural amounts of fears for all sorts of things to help keep us from danger. So when there is a real threat of tornadoes or severe storms, make sure you will be prepared. A. Know How to Check the Weather–If there is a severe storm threat, it is important that you will have access to warnings and so forth. For example, whenever I know we are under a severe thunderstorm watch or a tornado watch, I always check the maps for severe alerts or to see the entire watch area. You can check the National Weather Service’s website, or the weather channel’s severe alerts map. This information can help you realize where the storms are, what kind of warnings they may be setting off, and how long you will be under a watch. B. Know the Difference Between a Watch and Warning— A watch simply means, “Hey, there’s a chance a severe storm (or tornado) may be in your general area at some point between now and when the watch expires, so be on alert.” A warning means, “Take cover, a severe storm (or tornado) is in your area and you should seek cover NOW. Always keep those in mind and be prepared to act on that information. and browse their selection (disclosure, I am also an affiliate for Amazon.com). D. Find the Best Location in Your Home for Shelter–The best places to be in a tornado is the basement or lowest level of your home. Why? The closer you are to the ground, the less damaging the winds will likely be, and the greater your chance of survival. If you do not have a basement, then the best course of action is to find the most interior room (or closet) and get pillows, a comforter, or a mattress and place over you. Actually, it always amuses me when they suggest a mattress. How many people can really lift a heavy mattress into a closet or room? Anyway, if you can, that would help against debris (debris is usually what kills you). Ideally, you want to be away from all windows too. Also, if you go to google and type in “tornado damage,” you will likely see that the part of the building that usually survives is the interior room, or the basement, or the stairwell. That is why they always say that–it comes from years of researching what survived (and what didn’t) during a tornado. So get to the basement or lowest level, and then get away from windows and get to an interior room. If you have a mobile home, GET OUT. Either get into a ditch, or go to a safer place. There are lots of public places you can go (a hospital is usually a great choice), and even some places have shelters specifically for storms. You can also rent a hotel or motel (sturdily built) if you are going to have a risk overnight. The point is this: most people die in the mobile homes if they are hit by tornadoes, period. A storm shelter would also be a great option (I’ll get to that in a minute). E. Get a Storm Shelter or Safe Room–Whether you have a house or mobile home, safe rooms (above ground), or storm shelters (below ground) would be an excellent investment and would definitely provide a little peace of mind. Safe rooms and underground shelters really work well. I have seen many pictures and found many videos online of people sharing their story of how they were in a tornado, and survived in a safe room or shelter. In fact, one person was in an EF5 tornado that struck the Joplin area in 2011. They survived unharmed in their safe room! I am in the process of deciding on a safe room, and I hope to have mine finished by the end of this year. Whether you have a house or a mobile home (especially a mobile home! ), then I strongly recommend you get one. Especially if you live in an area that gets frequent tornado or severe thunderstorm watches. This should give you peace of mind. The above ground ones work very well, but to me the below ground are just a tad bit safer. Thunderstorms and tornadoes reveal the awesome power of God’s creation. It is perfectly normal (and even safe) to have a small degree of fear towards these captivating storms. However, if you find yourself stressing too much, then hopefully the tips in this article can help ease your mind and make you feel much better. In my own personal experience, the best strategy was to educate myself, learn how to read radars, know what to do in a warning situation, always be prepared, and invest in a good storm shelter for added safety. I hope this article has been helpful to you. If so, please consider linking to it from your blog or social media account.